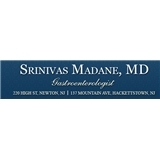 Srinivas Madane, MD (Newton) - Book Appointment Online! Our aim is to provide the highest quality of care in a friendly, relaxed atmosphere. Of course physician expertise is first and foremost. However, in my experience, I have found that a good ear and a friendly smile can often provide more healing power than the most potent medicine or the most advanced technology. We schedule appointments with enough time to let you completely discuss your problems without rushing, and we really listen. We don't feel good until you feel better! It was a great visit. Doctor was very pleasant and made me feel very comfortable. I am glad I picked him.